There's a swell little melody coming out of this custom liquor cabinet. 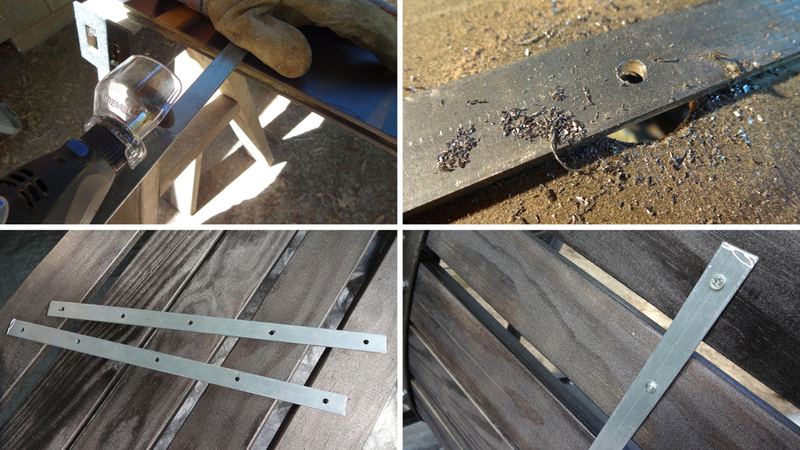 Could be that we used bona fide, whiskey-soaked, speakeasy-seasoned drumsticks to create the rails for it's doors. Just a true bit of musical history from the work of one of it's owners, an accomplished jazz percussionist. His old sticks were his donation to our "cause". Plenty of room here, Daddy-O, for showcasing fine libations and crystal within each luxurious compartment. The solid zebra wood-faced drawer keeps barware tools easily accessible and tucked well out-of-sight. We lined it's interior with a lush and flowered velvet, a nod to the exquisite style of the cabinet's proprietress, an elegant woman by rights and a doctor by trade. 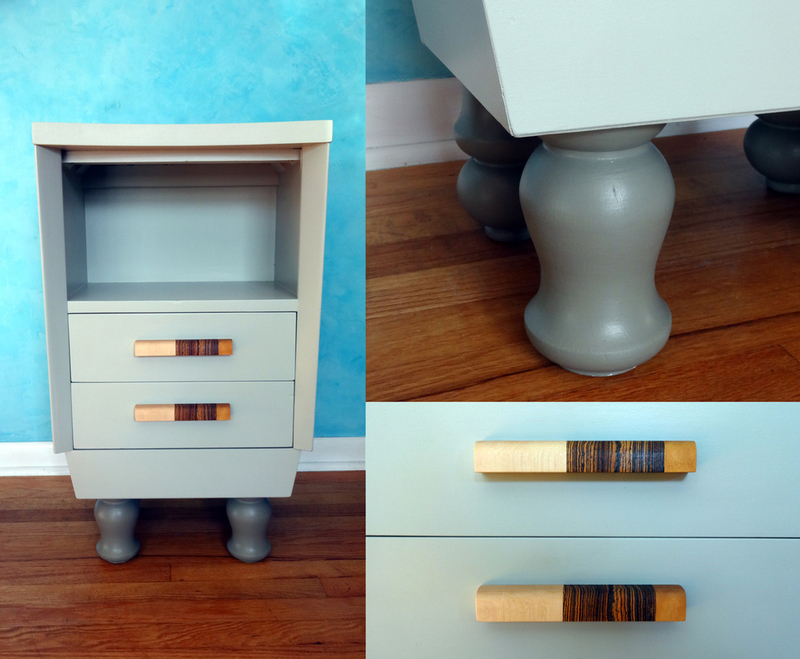 We chose a little more zebra wood to shape the legs and some aged copper hinges to add subtle interest and charm to this already formidable chest. Designing and building this bar cabinet was a hoot and a holler. We thank the wonderful couple who entrusted us with the honor and raise our glasses to them. Bottoms up! Custom-made tap handles shaped from maple and yellowheart. The heads are removable and each contain a blue circle chalkboard for chalky-chalky. The head on the left is the world famous (especially in parts of Scandinavia) Swedish crown. The head on the right is the super-obscure, imported, Japanese B-side type of head based on a never-noticed, repeating emblem on the Swedish coat of arms. Both handles will be secured to taps and pulled forward as often as possible for beer dispensation. Amen. Life is full of balance. Yin and yang. Night and day. Tom and Jerry. But we're talking about destruction and rebirth here. You tear down the roof. You tear down walls. Things collapse. Things get chucked. There's an almighty mess and disorder. But there are little nuggets. Nuggets worth saving, worth giving another spin on the tea cups. Old, solid wood. Dry, well-preserved, absolutely reusable. And bonus: Those precious nuggets don't end up in the dumpster. We took those nuggets, ran them through the trusty Rebirth-a-tron 2000 and created a kid-friendly, adult-stylish vanity. Always start with a trusty base. Clamps, and more clamps the unsung heroes. With some know-how and a little hardware, we made a handy, dandy drawer with easy sliding for little hands. "Open Sesame" just one of the fine games we play. 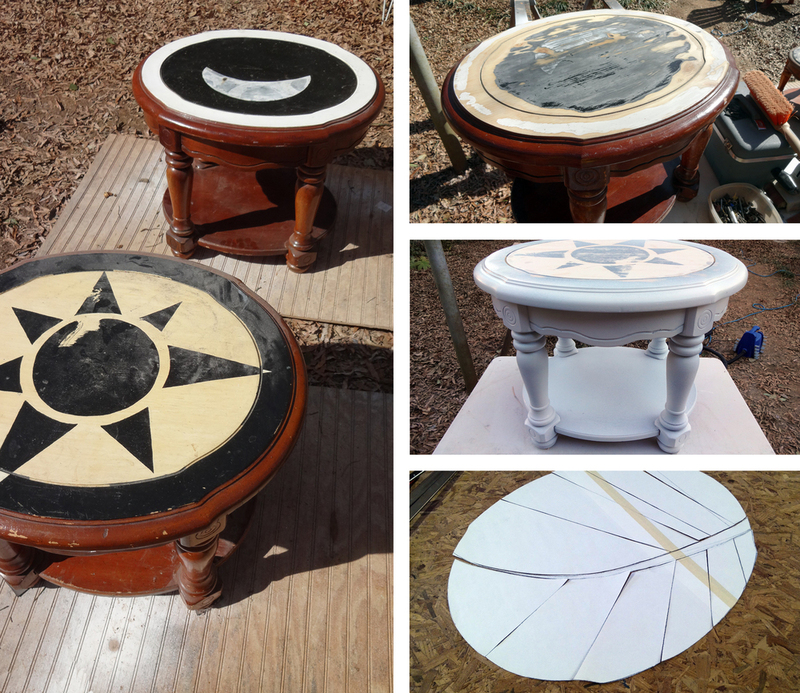 We painted the base and put the elements together. Stained and finished the wood, preparing it for a whole new round of service and beauty. 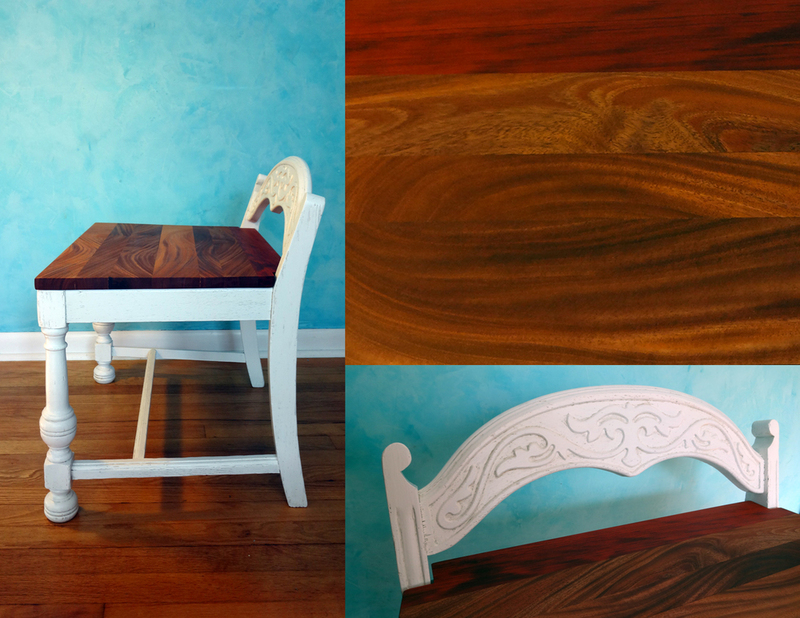 Sand, Sand, sand, cut, sand, stain, paint, relax. And then, boom! You've got yourself a pretty lil' vanity to call your very own! And we kept the global footprint closer to the size of the cute, tiny ones that will now use this bathroom. Let's here it for tiny feet. Pretty isn't always in pink. Have fun finding your own projects or just relax and get us to do the work! Besides were nice people. It will be fun. Just two lively rolling carts here. Footloose (literally) but not exactly fancy-free. They do have their duties, these two friends, but continuously work with a smile and a bit of zest. Reliable? Yes. Matchy-matchy twinsies? Always. Their frames were built from carefully selected boards of poplar with colored panels of birch plywood shaped to form the top and front facades. Disks of zircote wood were added as drawer pulls. These carts are perfect for standing work stations, entry check-in points, podiums or flexible storage. Simple design. Highly-functioning. Adding brightness and fun to any space. And when the work is done, unlock their wheels and let them get a party started. Fancy a bit of inexpensive luxury? Well, you're in luck. There are some serious hidden gems to be discovered at second hand shops all across this great land and beyond. This gorgeous lady was found all alone in a rough part of the store, lost, dirty, crazy eyes, the works! But her molding lines and hardware revealed some forgotten days of glamor. A tenacious spirit. A calming, graceful presence in the room. Firstly, there was some worn out drawer slides. She'd been roughed up, for sure. Used hastily. Disrespected. 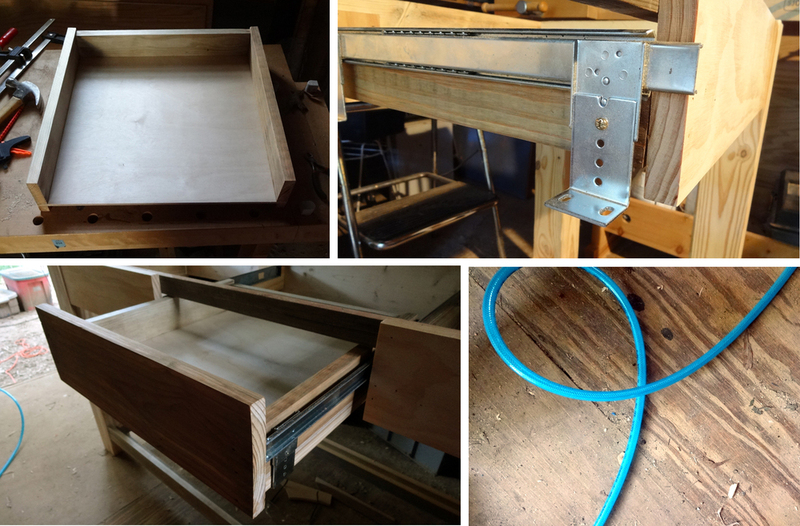 So, we cut up some nice ash slats and went along drawer by drawer to get her working just right. Got her confidence back. Once the hard work was done, she could relax knowing that what lay ahead was all candy and roses. She had a fresh, bright coat of paint applied to make her shine and we returned her cleaned-up, original hardware to the drawers because you can't forget where you came from. We also added a couple brass bird pulls to the top drawers and a little ceramic bluebird on her new display shelf to remind her of her new freedom. Her dazzling future. She loved them. Fallen on hard times, cast aside and looked down upon, this is who she's always really been. Strong, elegant and fun. We're so proud of her. Thanks for stopping in. And get out there in search of diamonds in the rough. There's more like our pretty bird that need rescuing. What do you need? I mean, really need? That's right. A liquor cabinet. 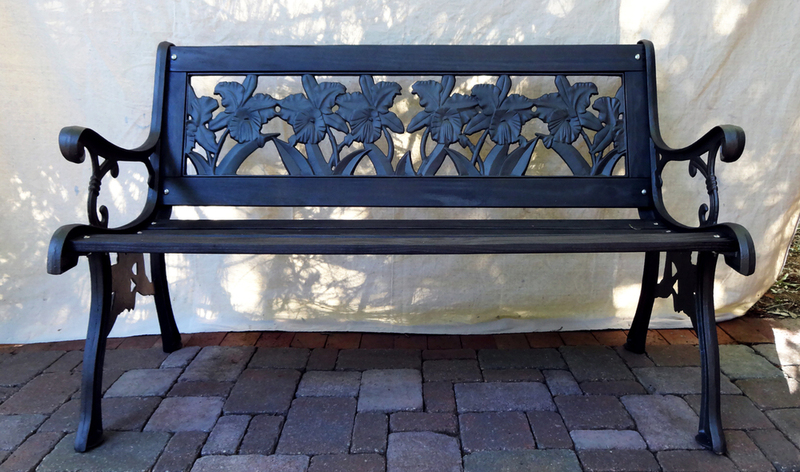 We designed and built this little guy for a man who knows what a gift is, a man of exquisite taste and, above all, a man who wants to give his wife a gift that finally, well and truly says, I Love You, Sweet Baby. This little guy (the cabinet not the man) is made of solid ash and finished with a black walnut danish oil. Inside he offers a large area for tall bottles, a smaller area for bitters and other mixers, an upper shelf and a drawer that's been washed in a light blue to complement the more prominent colors in his new home. But this man needed more. Cause he knows what love is, people. So, on top we added a removable serving tray which includes a large zebrawood cutting board and a cork-lined strip for glasses, mixing cups, etc. I mean, why ever leave the house again? Unless, you're out of liquor, of course. Happy New Year from Moss Robot. And so long, 2013. You done good. Oh, Mirror. We found you sitting all alone in a second-hand shop. You were once loved, but had been discarded. You were dirty and you were ugly. But, there was always something about you, wasn't there, Mirror. Yes, it seems there was. So we got you home and cleaned you up and helped you put on a fresh face. 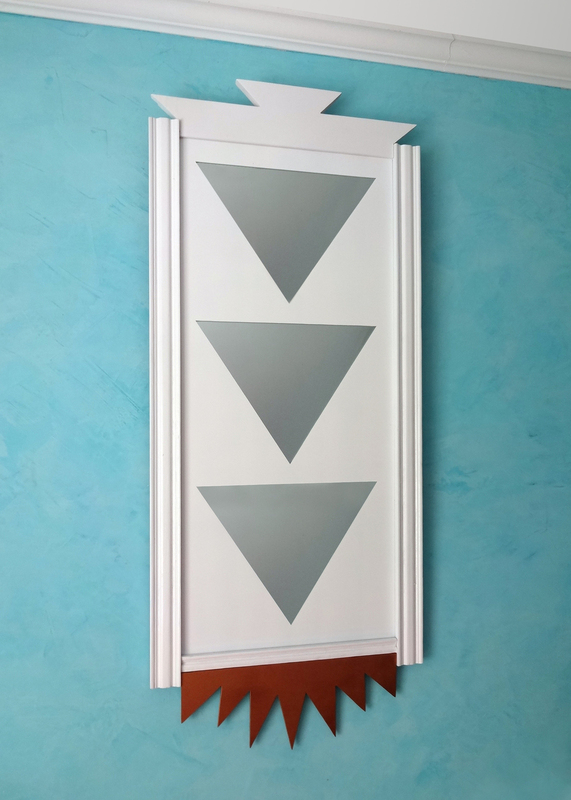 Triangles, you said, Mirror. Do you remember? And something fancy, you added. Something for the Hollywood stars. Something shiny. I want to be a star, you said. We rolled our eyes. But, sure, we said. ...Something for the star. How about a burst of metallic? And you grinned that delightful grin of yours, didn't you, Mirror? Oh yes, you did. And surely you would need a new suit, we supposed. That country-style brown just wouldn't do for you anymore. I want them to see me, you said. See that I am not just another mirror. We looked at each other, not exactly sure where this was going. Pure white, you whispered, with the twilight sky reflecting off you. Pure white. They will see me, you charged back. They will see and they will know. They will know this mirror and stand and stare and call me by name. There. Look there, they will say. It's Mirror Mirror. And, oh my, we said. We are creating backdrops and scenes for a multi media project we have in the cooker. We decided to start out by taking macro shots of things we deem cool or otherworldly. With lots of circuit boards and other electronic doodads lying around, we thought we would give them a go. We are always amazed with how certain pattern and forms repeat themselves in nature and in man made design. When we looked over our images, they were oddly familiar. It was as if they were aerial photographs of factories and interiors of industrial warehouses. We enjoyed pretending that each shot was a real place. What would it house? What things would it produce and how would people interact there? Come tour our imaginary Moss Robot Operations. Please remember to keep your safety goggles on and your Guest I.D. badges visible at all times. Our studio is splattered with little visual treats. We are accumulators by nature and any and all found curios and quickly-made concepts inevitably make their way onto shelves and trays and tables and sills. We try to stop ourselves. We try to keep it under control, try to keep from being overrun with objects. But we aren't minimalists. We want layers and a thickness of inspiration around us. 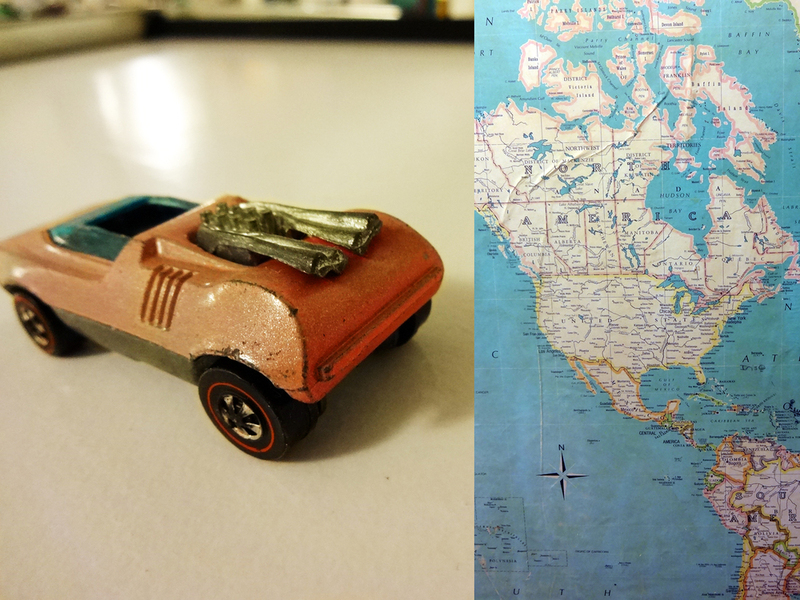 We want the stories these objects give us. We want their colors, their shapes. They are sculptures. They are ideas. They are locations, adventures, memories and fantasy. They are a collective history that grows unceasingly. More layers. More ideas. Maybe, they are the pieces of an ongoing work inspired by our connection to each other. Because together they will provide a rich and profound explanation of us that we plainly could not supply on our own. So, we worry less and less about being overrun by objects. And, instead, revel in the layers and the expanding jungle of inspiration. 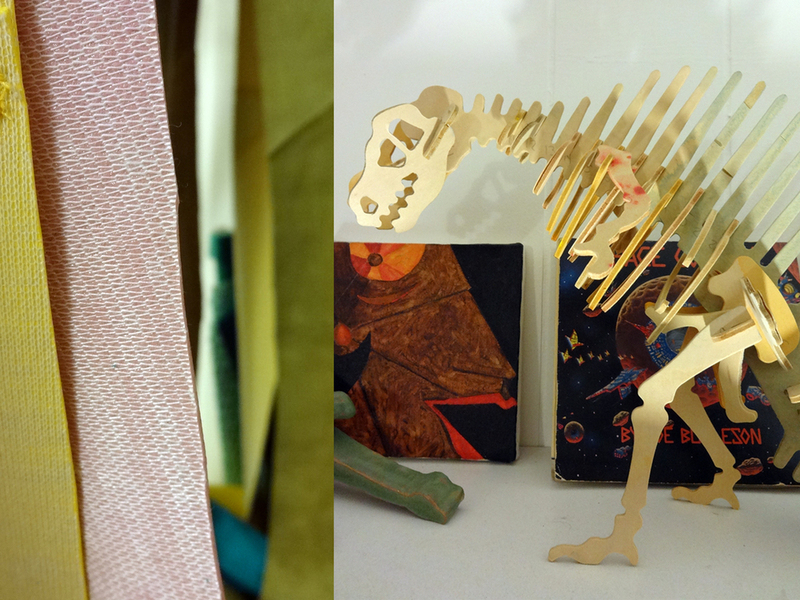 Recently, we had some fun gluing colored tissue paper together just to see what we might end up with. It's an easy little creative project that's perfect if you like to make a mess and get your hands dirty (gluey). Mix some glue and water together, dunk strips of paper into it and drop, hurl or lay delicately the paper onto a surface. Then, build up and up until either you've had enough fun or your fingers are stuck together. We formed our mass of paper on a piece of cardboard and once all the glue dried we cut off the cardboard and held the whole concretion over a light. Thought we'd share these really cool, other-worldly macro shots we made from different angles. Our ice-hockey-playing nephew, "Hat-trick Patrick," is a huge Sabres fan. (Spoiler alert, Lisa is from Buffalo.) 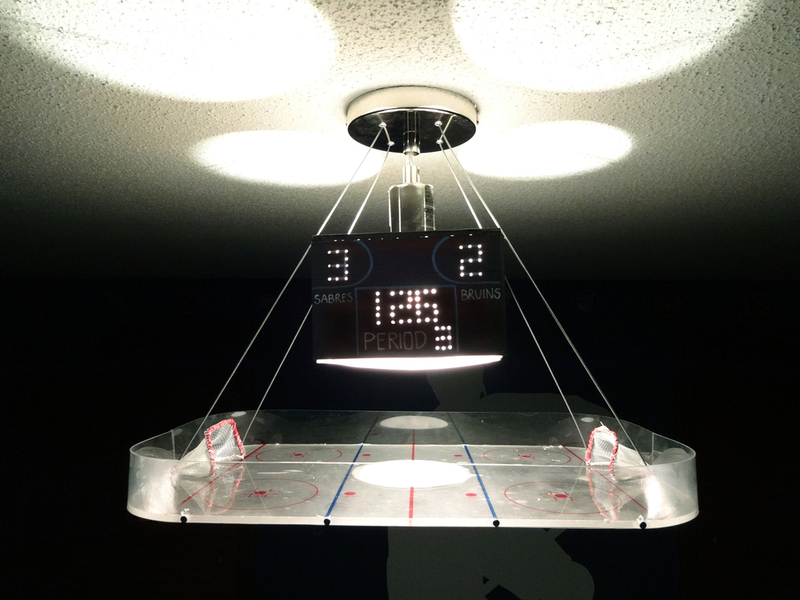 His room is decked out in all things hockey, so his mom asked us to make him a suitable light. She had found a generic one online that would have worked, but she wanted a Sabres version. Extra bonus: we let Patrick dictate what information we put on the scoreboard. Note the hand sewn hockey nets. That's love right there, people! Surprise, surprise! The Sabres are beating the Bruins, 3 to 2! When we delivered the light over spring break I got to go to one of Patrick's league games and we all got to witness his official Sabres hockey clinic and watch Patrick climb over the boards at the FNC arena and skate on the same ice that the real Sabres do! All in all, it was a fun project to undertake. And we add product recreation to the growing list of Moss Robot capabilities. 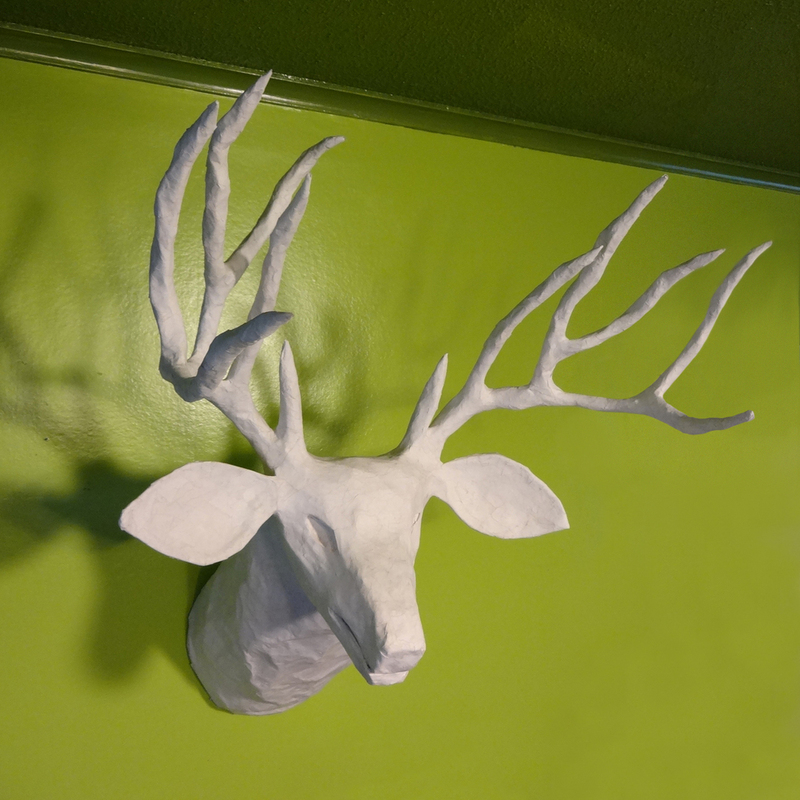 Recently, we were approached about creating a paper mache deer head. The request was to sculpt a realistic, life-sized 12-point buck wall mount. Now, paper mache deer heads are out there to buy, certainly, but the 12-point variety are as elusive their living, breathing counterparts. So, we gathered up our gear, made some sandwiches, set our sights and delivered this trophy to their door. No gun required. Night-vision goggles, optional. No actual deer were harmed in the making of this deer.